Ok. These kind of mistakes happen. Thank you for clarifying it. 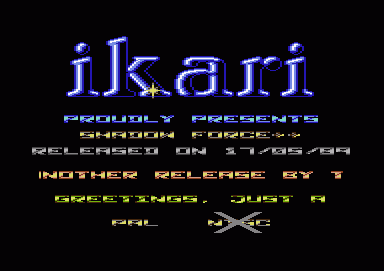 @sim: yeah, the old ikari-09 was just ikari-17 without the jack the nipper sprite sliding in the ramp, and was replaced with a new one. There is an error with the screeny. All the comments are not concerning this intro, but the other one. You may guess which intro I am writing about. Funny ripping the graphics from this cool game and use it in itro. Human of CFR used to this kind of stuff in many of his old demos (long time before this intro was made) so I guess it is inspired by him? Know Excell and them traded. Also it seems like this intro uses a PAL vs NTSC check routine, adjusting the code according to the system at hand. Smart stuff, a bit impressive back then. It's a cover of Spiral by Vangelis. A really old Classic by Pal/Ikari! The music afaIr is one by Jean-Michel Jarre, but not sure in 1oo%. I agree that this short but sweet music totally ruled!! A classic! The "elephant"-intro is classic. Great stuff. I like that tune. It´s short, but rockin. Simple intro with graphic from the fabulous "Jack the nipper 2"
The picture is a composition of various graphic elements taked from the huge game map. Color palette changes during map exploration.